This is a B-action movie from 1942 which promised escaped convicts from Alcatraz battling some Nazis on a lighthouse island. Sign me up! 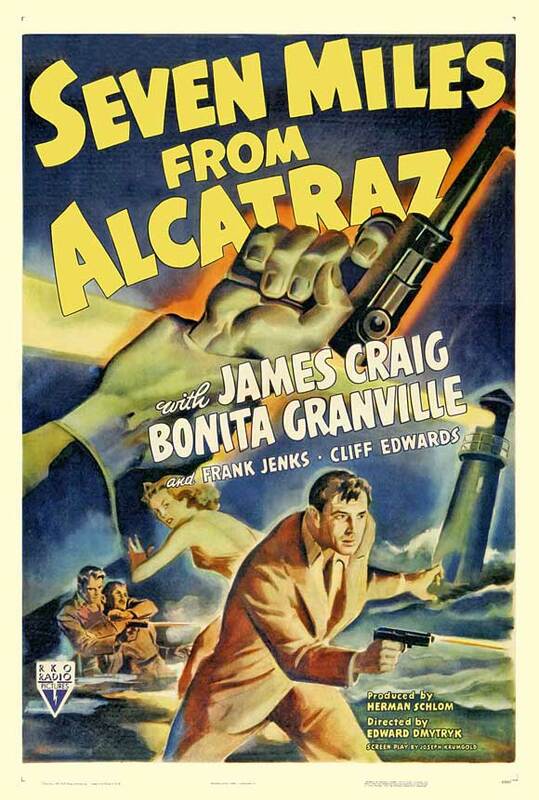 I watched SEVEN MILES FROM ALCATRAZ (1942) on 5.29.14. It was my first viewing of the film. Sometimes we look at old films like we might consider old golfers. Sure, there is a lot more black and white and the spring isn’t in the step. But we love ’em all the same because they are out there trying so hard. Throughout the five and a half years I’ve done this blog, I try to consider movies as I see them now, not as they were back then. Sure, consideration must be made for a historical trend-setter (like CITIZEN KANE) or an oddity (like Fritz Lang’s M). But for the most part, the question I ask is: How does it come across today. Considering a B-movie can be tough sometimes. Coming in at little more than an hour, these films often have the feel of thrown together forgettables. Not much time is spent on them, and they certainly weren’t made with the idea that one day there would be streaming movies for free and several channels that did nothing but run old movies in all their wart-filled glory. Yet, truly, they sometimes entertain more than they should. Such is the case with SEVEN MILES FROM ALCATRAZ. This is a film saturated with flaws. The acting is not much good, and they don’t try to make it so. The narration is often too obvious, too lazy, or just too much. That is, until they forget the narration altogether before reviving it in the film’s final moments. The escape from Alcatraz by two convicts, Champ (James Craig) and Jimbo (Frank Jenks), should be the best part of the movie. Instead it is glossed over with the explanation that the how-to in escaping Alcatraz is a professional secret. Eventually, these guys end up on an island with four people and a lighthouse. There is a lot of talk about war. This is not a propaganda film, per se, but it is a movie which takes plenty of shots at Hitler and ultimately tries to teach us that even convicts can be American heroes. It is all blatantly didactic, but its fun nevertheless. The first twenty minutes is pretty standard, not too exciting. Once one of the island goers is revealed as a Nazi, things really pick up. There is a surprising level of suspense achieved by Director Edward Dmytryk. Once this movie gets going, it doesn’t let off the gas. This isn’t SEVEN, but it has the right amount of surprise and unpredictability to make it entertaining. A final fight on a stairwell leading up to the guts of the lighthouse is surprisingly effective. Look, I don’t want to oversell this thing. The production quality is relatively low and the exterior shots are way to dark. But there is plenty of hour-long TV much less entertaining than this. Even if this is not Hollywood’s finest hour, it’s a good enough hour to find and enjoy. ~ by johnlink00 on May 29, 2014.